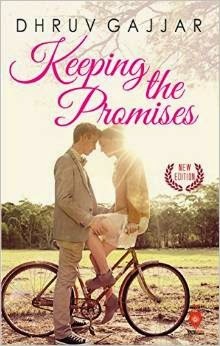 Everything About Books and Authors: Interview with Dhruv Gajjar author of “Keeping the Promises." Interview with Dhruv Gajjar author of “Keeping the Promises." There are a lot of creative people in this world and nowadays it is nice to see them getting a platform to showcase their talent! Here are a few questions I asked Dhruv Gajjar, the 23 year old author of “Keeping the Promises,” to understand his thought process and discover what makes Dhruv different from others his age! Tell us something about yourself…. A nerd who thinks he can tell good stories, and people have started believing him. Just started though! Story teller, dreamer and doctor - Where do you draw your inspiration from? Inspiration is something u can't draw, imbibe or take for granted. It comes from within. You need to take life as it comes and make a new beginning after every dark or mesmerizing hour. You learn to inspire yourself after every setback; you just need an inner will for that, which fortunately I have. Religious-less, guilt-less and judgement-less. Three grammatically incorrect, yet perfect words to describe me. Imperfection often streams the right chord. List is too large, but certainly some are close to my heart for some reasons and revealing them would be formatting a sequel to my book. Lol. Med books. I'm not allowed to read anything else right now. Scotch. I'd call it neither guilty nor pleasure. I'd say... Solace; because some of the memories I can only bear to remember under the solace of scotch. How do you spend your time on a holiday/Sunday? By doing every possible thing that makes me happy. Tell us about one thing that makes you happy…. In others, compassion which I hardly find and in me, arrogance which I bet u'll never find. Yes, in a way I'm never completely happy. Lol. If you were granted one wish what would you wish for and why? I don't believe in wishes. Let's say I've seen the dark face of it. I dream and try to make them come true. If I fail, I try again and I keep trying until I get there. I don't believe in plans, they don't work anyway. What advice do you have for budding authors? Writers never need advice; because the reason they are writers is that they have their own thought process which should be expressed and nourished, but never tampered with and experiences will make them learn what they need to. Every writer has an ability to observe and learn.